Do you get emotionally invested in the lives of fictional characters? Reading books, watching TV shows, I get super attached to these fake people. On evenings when we get to watch tv, I usually shed a few tears. I have mourned the death of so many fictional characters that I've lost track of how many made-up people I've cried over. We have been watching the Netflix series "Atypical," and last night, it got me. Atypical is about a teenage boy who has autism. I loved it right from episode one when the main character reminded me of one of my all-time favorite clients. (I know I shouldn't have favorites, but....sorry.) I also love that an autism story is being told on a show like this, so people can get a sense of what it's like. I feel like this show does a great job of showing sensory overload, language and social difficulties, and family struggles that come along when your child is diagnosed with autism. Without giving away any spoilers, I wanted to share this particular scene that got the tears flowing. [Mom]You know When you were five I made a list. [Dad]You got your love of lists from your mom. She loves a list. [Mom][CHUCKLES] I do. Anyway, I made a list of everything I hoped for, for you. I was trying to manage my expectations. Here. [UNFOLDING PAPER] "I hope he makes a friend. I hope he can communicate clearly. I hope he can leave the house on his own. I hope he does okay in school. I hope he finds something he loves to do. [Sam]" - Those are so easy. [Mom]- No. They weren't. They were hard. But every time I thought you couldn't do something, you did it. You're strong and determined. And I'm so sorry I underestimated you about college. You can do anything. Ahh, People!! That just got all my feelings going. I don't know who wrote this scene, but they must have read my mind. Those are the exact things that I hope for, for Colin. I hope Colin makes a friend. I hope Colin can communicate clearly. I hope Colin can leave the house on his own. I hope Colin does okay in school. I hope Colin finds something he loves to do. Deep down, I think we all want those things for our children. We want them to be happy. We want them to express themselves. We want them to be independent. We want them to be successful. We want them to do something that they love. When your child has autism, you find yourself questioning, "Will he ever do this? Can he do that? Will he ever get there?" When those questions and concerns for the future pop up, it's hard. Unknowns are scary. This mom said that she was keeping her expectations in check. I totally, 100%, completely understand that. You want to have hopes, but you want to be realistic at the same time. I just wanted him to sit at the table and work. I just wanted him to have three words. -He has several verbal words, uses his AAC device, and tries to imitate most words that we model for him. I just wanted him to go to a restaurant, sit at the table, and eat. -He did that this past weekend. I just wanted him to sleep through the night. -Hallelujah, Praise Jesus! He sleeps now. I really, really loved this moment on Atypical. It absolutely resonated with me as an autism mom. Tears were shed. I looked at that family on the TV screen, and I saw my family. 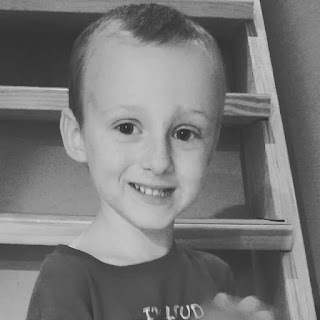 A mom, dad, and sibling supporting their boy on this autism journey. Those things that are hard today - I have hope that they'll be easy in the future.